Ever wonder what students do while working toward a Master of Science in Marine Biology? Of course there are the classes, labs, tests, seminars, papers, work, studying, networking, etc…add in sample and data collection, data analysis, etc…oh yeah, and then there’s the thesis and defense! Welcome back to our Graduate Program in Marine Biology student profile series! Julia Reynolds is our first student profile for 2018 and is finishing up her thesis following a successful defense on January 12, 2018. Julia’s research focuses on exploring the use of king mackerel abundance data for use in fisheries management processes and decisions. 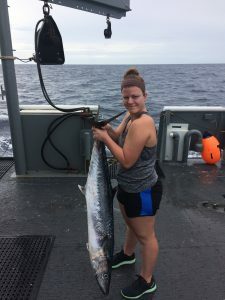 Julia has been investigating the formulation of the South Atlantic King Mackerel (SAKM) juvenile abundance index in U.S. South Atlantic coastal waters. She hopes the results of her research will lead to better informed and more proactive management decisions for this fish. Julia’s love for the ocean and its creatures was sparked from summer family vacations taken to the beautiful coastal waters of southern Maine. This love for ocean life grew into an interest in fisheries management. Her favorite part of her research is going out to sea to collect data. She finds a peace and tranquility on the open water that can be hard to find in the bustling ports and cities that dominate a large portion of our coastline today. She sees nature’s beauty not only in the ocean, but also in the mountains as she is an avid hiker. 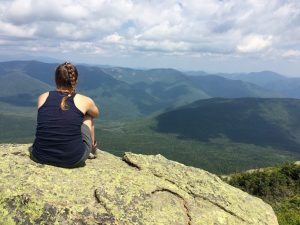 She has hiked both the northern and southern terminuses of the Appalachian Trail and the highest peak east of the Mississippi (Mt. Mitchell). This entry was posted in Graduate students, Research, Uncategorized by hiottkm. Bookmark the permalink.